SnapTime is similar to a stop watch. The difference is, it works in absolute time. Every time you click the SNAP button, it captures the current time and displays it in a list. A traditional computer stop watch captures the number of seconds since you started timing. What is it for? After I complained about the daily time signal being late, the National Research Council asked me to measure how delayed the CBC (Canadian Broadcasting Corporation) radio time signal is each day by the time it gets to Victoria. I wrote SnapTime to solve that problem, at least approximately. I can click SNAP when I hear the tone, and then can see how many milliseconds after 10 AM it is. I was also curious about how in sync my NTP (Network Time Protocol) computer clock is with my radio-syched watch. I can use it for that too. If you can think of other uses for it, please let me know. for the current version of SnapTime. Alternative type of stop watch. 118K zip for SnapTime Java source, compiled class files, jar and documentation to run on your own machine either as an application or an Applet. access snaptime source in repository with [Tortoise] Subversion client on wush.net/svn/mindprod/com/mindprod/snaptime/. 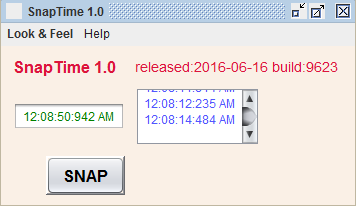 download ASP PAD XML program description for the current version of SnapTime. SnapTime is free. Full source included. You may even include the source code, modified or unmodified in free/commercial open source/proprietary programs that you write and distribute. Non-military use only.